Alabaster, Barn Red, & Black are 'Quick Ship' - Ships in 10 business days or less. All other Items on this page ship within 4 weeks. 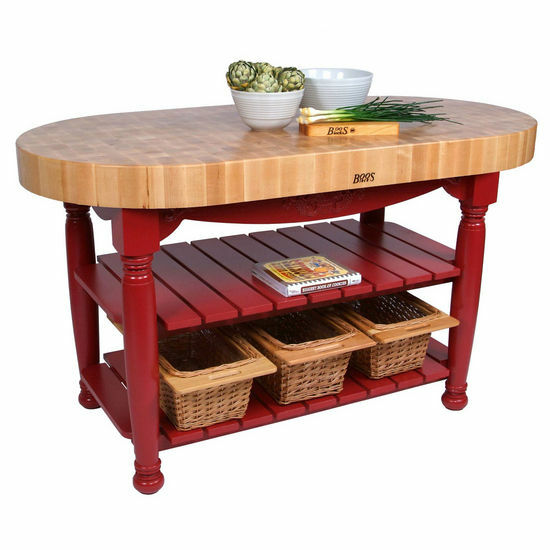 The Harvest Table is as beautiful as it is functional. This table made from 4" thick, solid end grain Northern hard rock maple, its impressive Cream finished butcher-block top will provide years of service. John Boos kitchen island will not only last a lifetime; it also will become a true family heirloom, lasting for many generations of kitchen memories. It is the perfect size as our kitchen is somewhat narrow - within 1 day of arrival two visitors commented on how much they like it and they didn't know it was new. Both commented on how nice it is to have rounded corners! We really do love it. But beware - it is a monster to get into the house! worth every step. Thank you! We did a lot of research on getting the right island for our new kitchen. 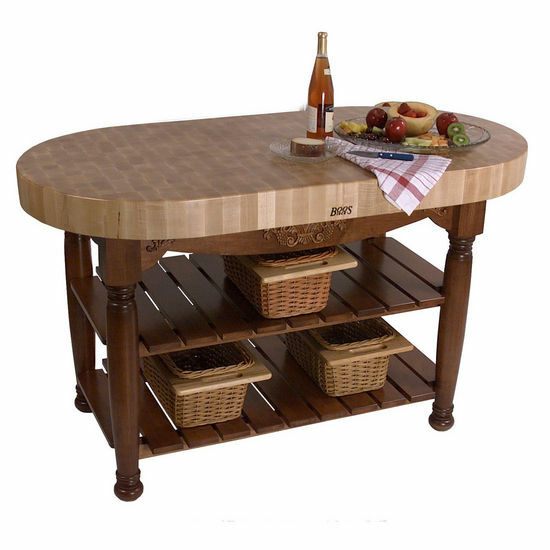 When we settled on the John Roos Harvest table, we couldn't wait to get it and knew patience was needed as the lead time was 4 weeks plus shipping. Surprise, Surprise. the Harvest Table arrived in 8 days. We were excited. This is one solid table! It is packed well and easy to assemble. It is heavy and needs a few strong folks to move it around (which is a good thing). We immediately put it to use. It's harvest time here and my wife is in full swing with canning. 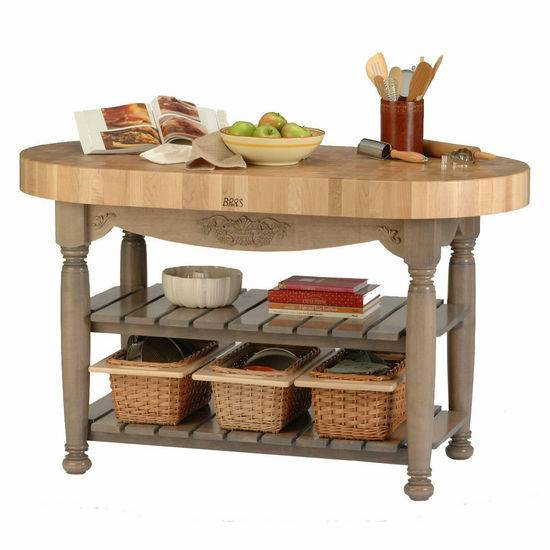 This table the perfect work place for making preparation for canning a breeze. We use it for everything we cook. It the perfect height and the stored underneath is great. We are very satisfied. 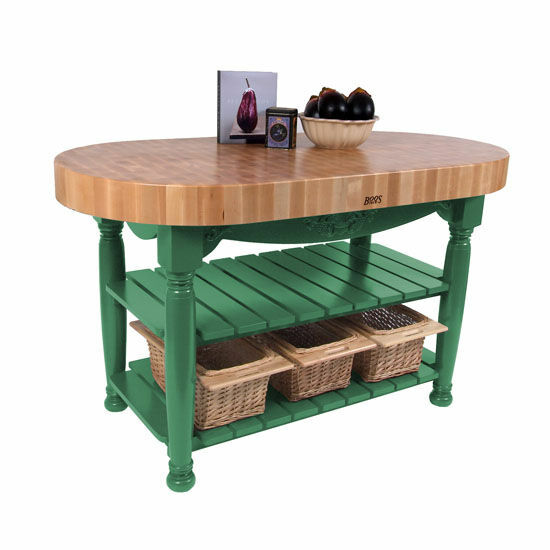 This is an amazing butcher block. When re-doing the kitchen I was originally going to to a built in island until I saw this table. It's built to last, looks great in my kitchen and can easily be used as s dining table with the addition of some 25" high stools. You'll want to make sure you have some help available. It's a beast of a butcher block! The table is beautiful. We love the oval shape. Looks great in the kitchen. Worth every penny-everyone loves it! 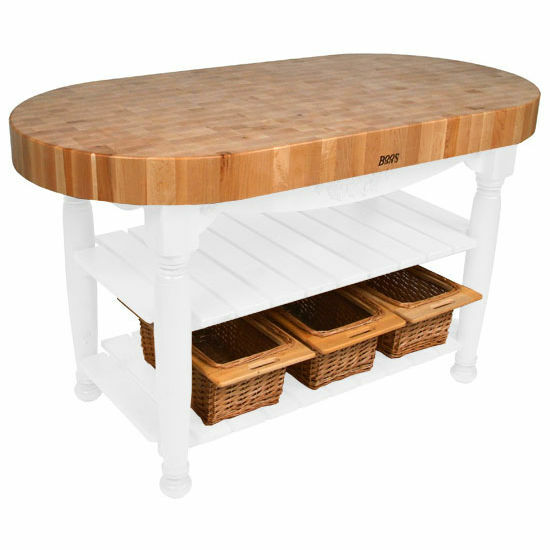 This harvest table is absolutely beautiful and the alibaster is white, even if they say it is a little off white - it is perfect with white cabinets. It is so sturdy it will last forever! We love it and Kitchensource is top notch to work with - thank you! Could not be happier. Exactly the way it was described. Quick service and delivered to the door. Took about 10 minutes to put together with basic socket and wrench set. 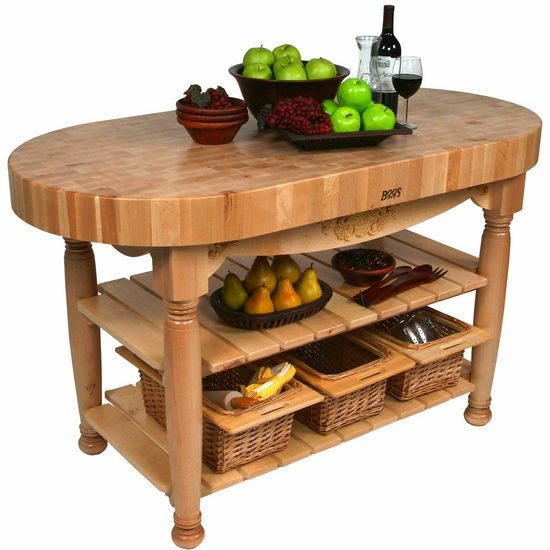 But, it took 2 strong adults to turn the table over and get it on its feet once assembled as it weighs about 250 lbs. Well made and the butcher-block top was better than I expected. A fantastic addition to our kitchen and will be a part of our family for years to come. Item JB-CU-HAR60-BN weighs approx 260 lbs. Unfortunately John Boos does not customize their work tables to different sizes. 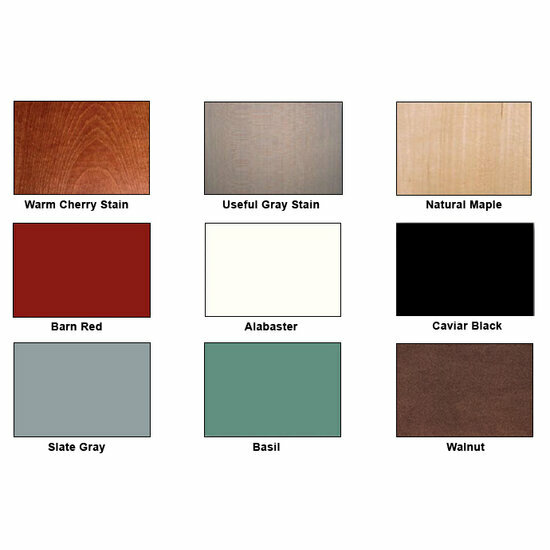 JB-CU-HAR60-N is a natural maple, which would be a maple with a Varnique finish. The Cherry stain would be just as it says, maple wood with a cherry stain finish. It is made from solid maple. No, unfortunately it is not available for use with wheels. 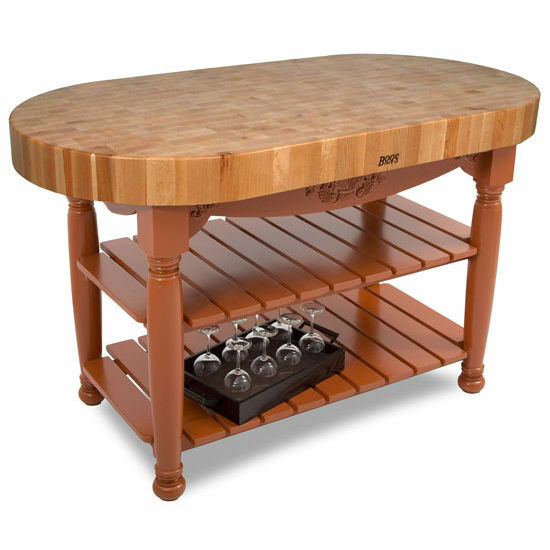 It does not, and due to the size of the table, we don't suggest any casters to be used with it. Here are the specs you requested. Hope this helps!